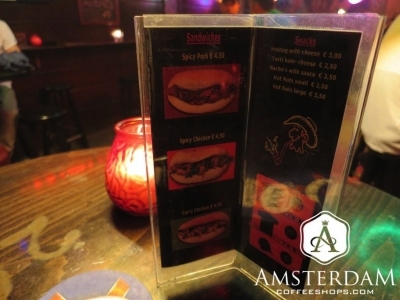 Coffeeshop Smokey is located in Rembrandtplein (Rembrandt Square), an area of the city known for its restaurants, bars, and active nightlife. It is upbeat, loud, and active - a large draw for tourists. Smokey appears to fit into this neighborhood quite well. As soon as you enter, you will notice that this is not a typical Dutch coffeeshop. Far from quiet and relaxed, the vibe of this establishment is fast and loud. Smokey is most reminiscent of a theme restaurant; think the Hard Rock Café or Planet Hollywood. There are a lot of colorful lights and decorations hung about, classic rock or contemporary music is heard playing over the speakers, and the place is usually packed full of tourists and waitstaff alike. 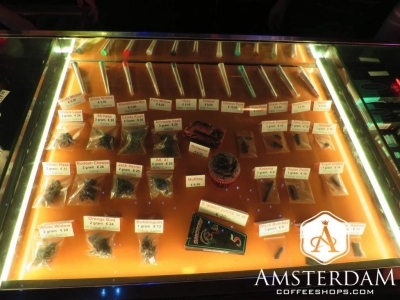 Coffeeshop Smokey has a large selection of cannabis products, both on the flower (weed) and hashish-side of the menu. Instead of providing the traditional paper menu, you will find a glass display case here. Found on the left side of the shop when looking in, all of their offerings are on display so that you can examine them before purchase. As expected, there is also no shortage of food and drink options here. Smokey is not really an ideal grab-and-go establishment for connoisseur cannabis. Rather, it is the type of shop you visit with a group of friends for some smoke, drink, and food. Note there is also outdoor seating, if you and your group would like to enjoy some fresh air. Coffeeshop Smokey is a larger establishment located directly on Rembrandt Square. This shop is focused on a full service experience, which includes cannabis, drinks, and food. This shop is worth a visit if you are in the area, and a special trip if you are with a group and looking for a more restaurant-oriented experience like this. If I could give this place no stars I would.We just arrived in the location having just found our hotel. We all stopped at the ATM before arriving at the coffee shop. When we arrived the place looked quite nice and the staff seemed friendly. We were asked for ID and then found a table inside at which all 5 of us sat. Myself and a friend went up to the bar. My friend purchased and item to the value of 5 euro. She handed the bar man 50 euro which was the only note she had on her person having just been to the ATM. The bar man handed back 5 euro in change. My friend said sorry I gave you 50. His reply was quite frank and immediately shot her down and said no you didn't. We asked to speak to the manager. We were expecting to be met with some hospitality and some reassurance that they could try and resolve the situation as the bar was quiet and there were several cameras facing the till. This lady basically came down and was like you didn't give him 50. We tried to explain the situation and each time we spoke she cut us down and was like sorry your interrupting me and kept telling us we were rude. She walked away from us muttering. The lady with blond hair approached us calling herself a manager. I have never been spoken to by a manager in such a rude and uncaring way towards customers. She came back and her initial stament was "now are you going to listen to me". She spoke and then gave a pause. When she paused we replied. Again as soon as we spoke she cut us down again claiming that we wernt letting her speak and claiming we were rude. Her game here seemed to be: play pissed off with us and tell us we were in fact rude and wrong at every point. As soon as we mentioned the police she shouted and handed us back the 40 euro that was stollen from us and shouted at us telling us we had 10 seconds to leave. I stood up and then went to reply at which she then pushed me on my shoulder. This lady is vile. She calls herself a manager and I for one have no respect for this lady what so ever. Her short fuse, angry temper and complete disrespect for people is truly shocking. All that we wanted was cooperation on the matter that the man behind the bar stole 40 euro from us. If the owner is reading this I invite them to watch the camera at the 14th of May at 9.30 pm. We are a group of 5 people who sat across from the bar. When you do see that we were right I would hope you have words or even fire your crazy, inadequate, rude manager !! !